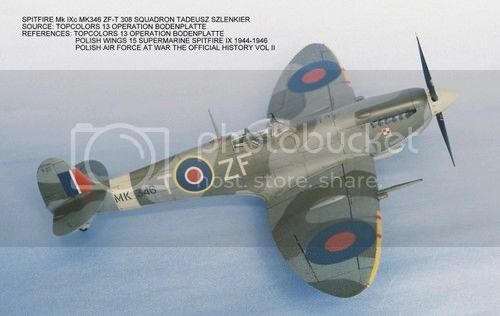 Eduard's 1/48th Spitfire range is quite comprehensive with various marks produced. Each kit has been released as a profipack version, then as a Weekend edition. 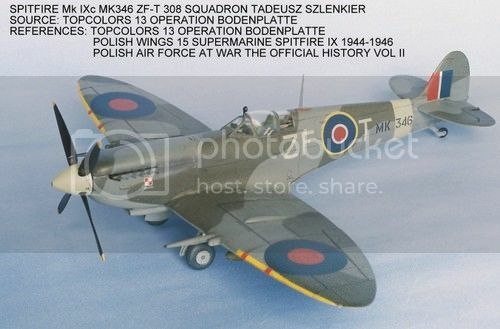 The latest Weekend edition release is the Spitfire Mk.IXe, and as with all weekend edition kits, no masks or photo etch is supplied and only one set of markings is included. Packed in Eduards standard top opening box the kit has 4 light grey sprues and one clear sprue. Exterior detail is very good with recessed panel lines and raised rivets. Interior detail is just as good with detailed undercarriage bays, and a nicely detailed cockpit. One small set of decals and a A4 size instruction booklet make up the contents. The build starts with the cockpit, and some of the sidewall detail is moulded into the fuselage halves, with a couple of oxygen bottles, a throttle lever and a couple of other parts being supplied as separate parts that fit onto the lower sidewall inserts. The sidewall detail is very good with spars, and a few instrument panels and a couple of other parts as raised areas. Ejection marks are pretty non existent on most of the parts but I did find two small dimples on parts F-26 and 27, which will need filling. The pilots seat frame has lightening holes, but these are not drilled out.The frame behind the pilots seat frame is only supplied as a top part, but considering you won't see much of this part once the kit is built it doesn't really matter that much. The pilots seat is made up of the seat bucket, two side parts, and a seat lever. The seat has an armoured plate to fix to the rear, and a flare rack in the front. No harness is supplied for the pilots seat. The next stage in the build is constructing the cockpit itself, with the floor having some nice moulded on detail. The pilots seat framework and seat attach to the sidewalls, with the control column and linkage, which is made up from three parts, fitting into a pre drilled hole in the floor. The instrument panel doubles up as the forward bulkhead, and two instrument panels are supplied, one with raised bezels, for painting yourself, or a flat part which has a decal supplied. A gunsight made up of three clear parts fits onto the top of the panel. A compass is added at the back of the instrument panel and protrudes through the underneath to the front of the panel. A couple of rudder pedals finish the interior of the build. The other sidewall is glued into place making a neat cockpit sandwich. The cockpit is attached to one of the fuselage halves along with a shelf in the engine bay, and a part for the spinner to attach too. The tail wheel sits in a two part socket piece that needs to be fitted before the fuselage is closed up. Once everything is installed into the fuselage halves both sides can be mated together. The fit is exceptional, with very little filler, if any, needed along the seam lines. I did clamp the halves together to ensure a snug fit whilst I worked on the next stages of the build. The wing roots leading edges are attached to both sides of the fuselage at this stage as well. If you want the canopy closed, then a couple of cockpit sills need to be removed, they are highlighted in red in the instructions. The lower wing is supplied as one piece, with the undercarriage bays made up of several parts each. This is a pretty good way of moulding these parts as detail can be included onto the part from the moulding process. A spar runs along the center section of the lower wing, which should strengthen the wing, and forms part of the front wall for the gear bays. Four 1mm holes need to be drilled out on the lower wing for the external bombs to be attached later in the build. Once all the undercarriage parts are fitted the top two wing pieces are added. The fit is good with only a quick swipe of some sandpaper needed along the joins. The wings are now attached to the fuselage. The fit is very good, if a little tight. Pretty much all Spitfires I have built there is a gap along the wing roots that needs to be filled, but the way Eduard have engineered this kit no gap is present, which is a nice surprise. Next up is the exhaust stacks which are slide-moulded and have openings. This bit is quite fiddly as two backing parts fit behind the exhausts to simulate an engine behind them. The exhausts then fit onto the a lip on the fuselage with then a two part cowling fitted over the top. The exhausts will need painting and masking, as they can't really be fitted at a later date. The tail plane and rudder assembly is next up, with the tail control surfaces as one piece. the fabric and rib-tape texture is well done. two small parts fit onto the tail, and with careful gluing the tail planes can be moved off center. The rudder is also attached and can also be moved off center if desired, with some careful manipulation of the locating tabs. The wing ailerons are separate, and are the metal type and they have some very fine rivet detail moulded onto them. These can also be set at a sensible angle if desired. 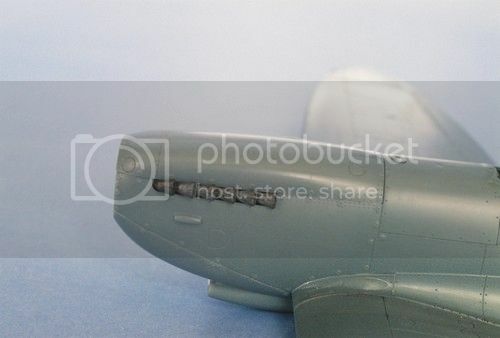 As this mark of Spitfire has clipped wings, a wingtip insert needs to be attached. You have a choice of using a clear part, or a plastic part.As both parts have the navigation lights moulded onto them then its up to the modeller which to use. For this build I attached one of each. The second to last major part of this build is the radiator housings, of which one underneath each wing needs to be installed. The detail is adequate with raised mesh on the radiator front and back. The radiator flaps can be modeled open or closed, with the only difference in the build being one flap actuator is longer than the other. The chin air scoop is a two part affair and fits underneath the engine cowling. The undercarriage legs and wheels are built up from 7 parts, with the tyres split down the middle, which does create a seam that need to be sanded. detail is ok with a separate oleo for each leg supplied. The legs fit into holes in the bays which do angle them at the correct angle. Eduard do supply a diagram in the instructions for their correct angle and rake. The tail wheel gets inserted into the socket, which is a very tight fit. A four blade propeller fits onto a backplate, with the spinner glued over the top. The built unit then fits into a hole at the front of the aircraft, which will need to be glued into place to stop it falling out every time you pick the model up. Two canopies are supplied, a two piece and a three piece clear parts. The two piece is for the canopy to be closed up, with the three piece for the open option. A small clear mirror fits onto the top of the windscreen.The cockpit door can be modelled open or closed. External stores for this kit are in the way of two bombs. these are made up of 8 parts each with the racks. The last part of the build sees the cannon barrel sleeves, two ariels and the bombs with the racks fitted. This build took me around four hours to complete, with much of it down to the comparative ease of the build along with the tremendous fit of the parts. The only area which needs a little filling is the engine cowling and the seam running along the top of the fuselage to the windscreen. The instructions are printed on a A4 size booklet with black on white drawings. the build takes place over 10 pages, with internal colours given along the way. The build is in a logical order, which I actually followed, instead of doing my normal thing and wandering off building other parts. One nice addition is the full colour profile for painting and decaling the kit. Most other weekend edition kits have this part on the box lid. The decals are printed in house by Eduard and in register, slightly matt and have good colour registration. One marking option is supplied with this boxing. LF Mk.IXe, TE570, Letecký pluk 7, airfield Praha-Kbely, September 1946. Verdict: This is a superb little kit that builds up well. Eduard are rivalling Tamiya with the fit. I had a lot of trouble with the two piece upper cowling. Twice I stripped off the paint and polished the seam but it still showed as a faint dark line through the paint. Ultracast have just released a one piece replacement resin cowling that should solve this problem as well as exhausts that can be fitted after painting. The fit of the cowling was so good that I held it in place with Blu-Tac while I painted the model gluing the exhausts and cowling in place at the end of the build. The propeller was fitted at the same time and I was able to invent a way of stopping it falling out. [quote]Hi Andy Nice one! I really like the idea of "raw build" reviews. Me too, there was an American magazine series published about 12-15 years ago doing exactly that.